Reserve Your Room Today! Reserve Your Room Today! Explore the Mansion and Grounds where a President was born! Come walk the grounds where President James Madison drew his first breath. Take in the grounds where James Madison’s mother, Eleanor Rose “Nelly” Conway Madison was born, grew up and returned to have James. Walk through the mansion that Union soldiers forced a family from to take it as a Union Headquarters. Stand in the bowling green where Union soldiers set up camp. View where John Wilkes Booth rode the ferry across the Rappahannock River on the way to Garrett’s Farm. Learn about the Union detachment pursuing John Wilkes Booth stopping to rest, eat and sleep at the plantation. Stand in the Grand Hallway where one of those officers slept. As you walk through Belle Grove Plantation’s mansion, you will feel instantly transported back with our period antiques. Each room is filled with antiques that reflect a time in the history of this grand Southern plantation. Our collection was started in April 2013 and has continued to grow. From pieces that were found in antique shopping trips to antique auction, each piece tells us a story of the past. Our collection include very special donated pieces from individuals who wish their pieces to be a part of this very grand landmark. Each of these donated pieces from our candelabras in the parlor to the pewter chess set in the library have come to us with very unique stories that will live on as part of Belle Grove Plantation. We invite you to come and experience the sights and sounds of a true Southern Plantation. 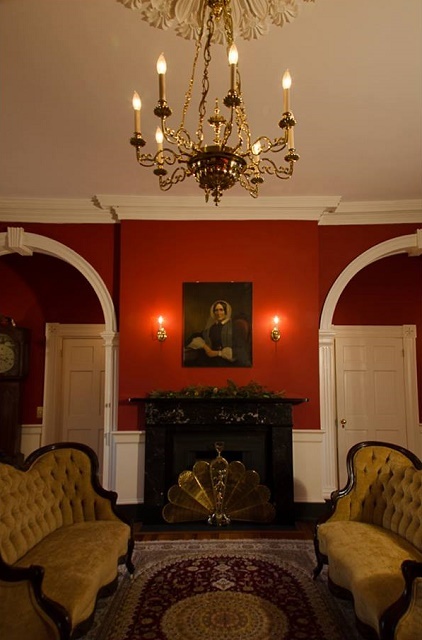 There is nothing so beautiful then to see Belle Grove Plantation’s historic mansion dressed for the holidays. Starting on the day after Thanksgiving, groups of amazing designers come together to bring the magic alive. Each room is selected by a group to decorate and each are a masterpiece to behold. As you tour the mansion, we ask that you please select one room that touches your heart. At the end of your tour, we ask you to please vote for your favorite. At the end of December, we will total up the votes and award 1st, 2nd and 3rd place prizes to the groups. 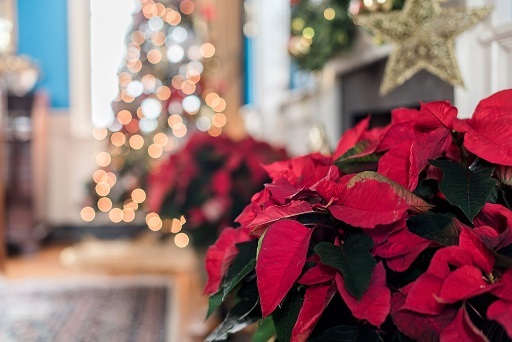 We invite you to and get into the holiday spirit with a tour of the mansion during the month of December. We are open to the public for tours Wednesday to Sunday from 1pm to 4pm. No reservations are required and no schedule of tours to remember. Tickets are sold at the door only. Just come and enjoy the wonders of it all. Please note, we ask that you please check our website for closed date due to weather or private events before coming. These can be found on our home page, tour page and calendar page. Our tours are a guided 45 minutes to 1 hour tour through the mansion. All rooms are open with the exception of those that are occupied by overnight guests or event spaces during that time. Grounds are open for self guided viewing with restrictions on the Caretakers home. Unable to make it during our tour hours? Call and schedule a private tour! While we understand that not all can come during our tour hours, we do offer a private tour option when date and time is available. Private tours require at least 5 people and must be schedule ahead of time. Tickets are sold at the mansion. They may be purchased with a credit card or by exact cash. We do not maintain cash in the mansion. While Belle Grove Plantation is a historic site and bed and breakfast, the mansion is also a private residence. We do not allow individuals to enter and wander around the mansion unaccompanied. The grounds are open only during tour hours. We would love to have you come and visit, but please respect our home and hours. Belle Grove Plantation does strive to provide the best possible accessibility to the mansion and grounds to meet our visitors’ diverse abilities and needs. However tours at Belle Grove Plantation do involve a fair amount of standing, walking, and stairs. Chairs are provided within rooms for those that can not stand. One of the questions we get quite often is did Belle Grove Plantation have slaves? Through our research, we have uncovered names of slaves in wills and death records as well as through the Federal Census. In the Federal Census of 1840, owner Carolinus Turner showed 57 slaves. In the Federal Census of 1850, he had 72 and in the Federal Census of 1860, just before the Civil War, he had 92. The oldest slave we have been able to uncover was a female slave who was 80 years old. We have made “connection” with the slaves of Montpelier, James Madison’s home in Orange, Virginia. Three slaves, Anthony, William “Billy” Gardener and Suny were known to have come from Belle Grove to Montpelier. Looking at President Madison’s grandmother, Rebecca Catlett Conway Moore’s will in 1761, she gave James Madison, age 10 a choice of five slaves. Now, you can come and hear about one of our darkest times in Belle Grove Plantation’s history. Our Enslaved Experience and History Tour will cover not only our known history of our Belle Grove Plantation’s Enslaved Community, but will take you on a historic tour of the experiences that slaves endured during this time in American History. See artifacts, both from other areas as well as Belle Grove Plantation with known slave connections. 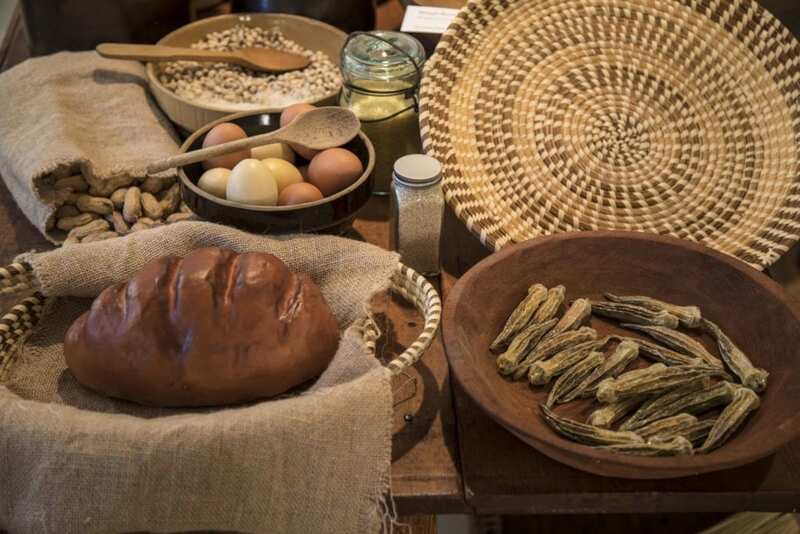 Learn about how Africans changed the way we ate with foods and cooking techniques they brought with them. We would like to caution you before you select this two hour tour. The subject matter can be graphic at times and is not recommended for the young or easily offended. Please consider carefully before booking your reservation. Two Hour Tour conducted Wednesday to Sunday at 2pm each day. 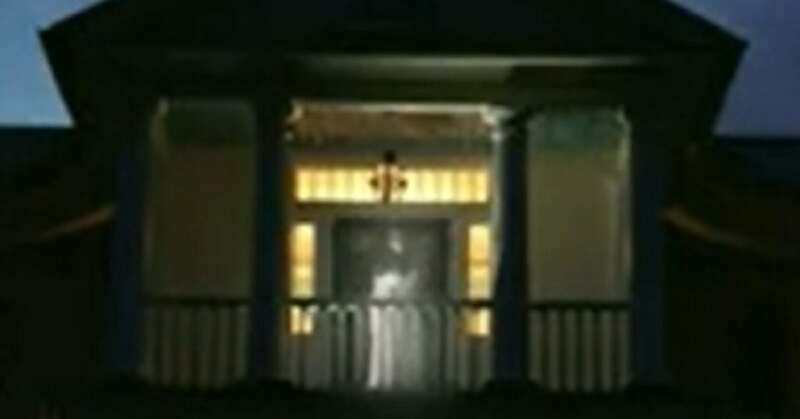 Is Belle Grove Plantation Haunted? Many people and paranormal teams have tried to answer this question. Even the SyFy Channel’s Ghost Hunters has investigated. All that come away have the same answer . . . there is definitely something there. We have seen apparitions. We have heard voices and sounds. We have seen a ball of light in broad daylight! We have photographs that just can’t be explained. Now we are challenging you to find out for yourself! Come join us as we discuss past experiences, share photographs, videos and EVPS (electronic voice phenomenon) and do our own paranormal investigation of the grounds. Please note – These are a paranormal investigation, not a history tour. Parking is free and available on the left side driveway along the tree line. Belle Grove Plantation Mansion and Grounds Tours will be closed in for the following dates due to Private Events or Holidays. Belle Grove Plantation will reopen on the next normal tour date. Private Events can be adding at anytime. Please visit our Tea page for Afternoon Tea dates not available. Please check our website before you come to visit for any updated dates. Thank you. Come spend the day where great men and women walked. James Madison, George Washington and many more have walked these grounds. From the beginning history of America, Belle Grove Plantation has stood witness to it all. Touched by colonial expansion from Europe and by Civil War, Belle Grove Plantation has played a part in the creation of a nation. 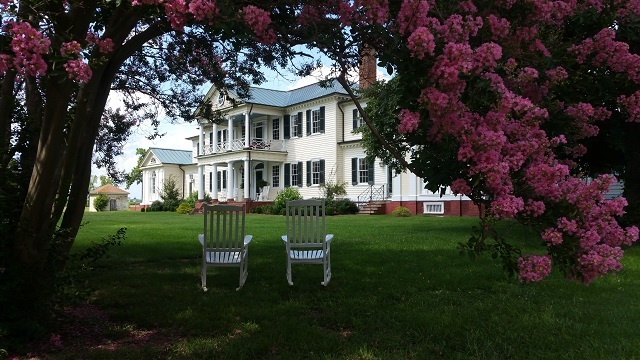 Belle Grove Plantation offers group tours for 20 or less people. Luncheons are available for an additional charge. Cost is determined by the catered menu. Please email us at information@bellegroveplantation.com to schedule you group tour and to discuss luncheon options. We ask for at least two weeks advance reservations for groups. Sharing the history of Belle Grove Plantation with students helps a new generation to come to understand what life was like at Belle Grove Plantation. 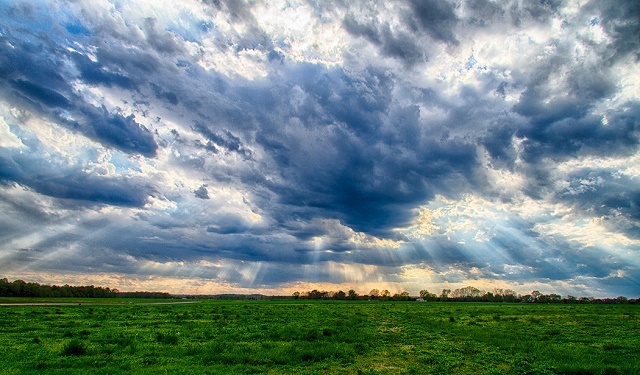 At this time, we are working on creating a program to offer a view into the life on a Southern Plantation. We hope to offer this soon.